Beat the heat and keep your cool with a Fiesta Awning. 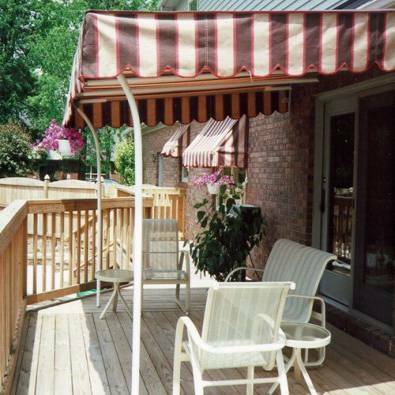 These awnings are an excellent choice for shading large areas such as patios and decks. These easy to install awnings not only add beauty, they also provide protection from the sun's harmful UV rays. You can enjoy your patio even more with these versatile awnings featuring durable Sunbrella fabrics. These awnings provide more shade than most patio and market umbrellas. This 22 foot 6 inch wide awning has three slope lengths to choose from: 8ft, 10ft, and 12ft. You have several color options with your choice of 20 brilliant Sunbrella fabrics in 14 solid or 6 striped colors. There are 12 edge braid colors to choose from to give your Fiesta Awning the look you want. The 4 valance options are just the right touch for adding a look of elegance. All valances have a 10 inch drop. Note: Thread color will be closely matched to the fabric color. When a color match is not available white thread will be used. The frame on the Fiesta Awning is made of 1-3/4" galvanized steel tubing with a white powder coating, and all fittings are cast aluminum. Unlike retractable awnings, these awnings are supported by their own legs at the front of the canopy. They attach easily to your home whether it is wood or brick while the legs support the front of the awning. This type of construction takes a large portion of the weight of the awning off of your wall and distributes it to its own leg supports. Awnings up to 12 feet wide will have two leg supports while awnings over 12 feet wide will have three leg supports. Legs mount into the concrete or wood deck 1'-6" behind the front of the canopy. The Sunbrella canopy is easily removed for easy cleaning or during the winter months. The canopy is not designed for snow loads and must be taken down during winter months. Frame work tubing is available in white only. Installation usually takes 1-2 hours. Please specify if mounting to a wooden or brick wall and if the leg supports will be attached to wood or concrete.